This Medical trip consists of 3 doctors from the SF bay area, a PA from Canada, a dentist and dental assistant from St George Utah, 3 nurses from Canada and SF, 2 interpretters form the UK and SF bay area, a socail worker from Sf Bay area, and two children 11 and 15. We have Haitian team members doctors, nurses, interpreters numbering 28. About half the team have been on multiple trips with Sionfonds medical expeditions and most of the Haitian staff have been on all of them so I believe we are as fine tuned a Mobile Clinic Machine as we can be . Meaning; we prepare, we collect things, we arrive and then we roll with what ever comes our way. I do not know how we attract such outstanding agreeable, easygoing, Magivering people, to these trips but they make our medical trips fun and effective to our ultimate goals of helping Haitians in remote areas where there is no other medical or dental care available and maintaining the health of the children at our schools. This trip is no exception, on arrival despite 13 of our bags – the ones with most our meds – not arriving with us, we hit the road for La Cayes. Thursday we held clinic at our school in Cavaillon. 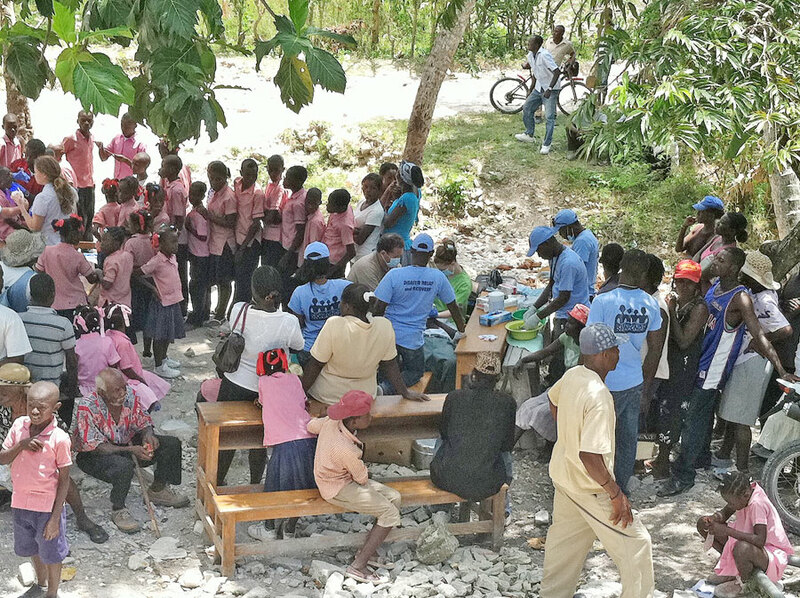 We had a lot to accomplish at Cavaillon; the medical clinic, seeing all the 250 children for assessments and community members in need of medical attention, this trip we have ‘ only’ one dentists who checked the sealants on every child, and then pulled approx. 140 teeth out of 80 mouths, we had a team applying sealants to children who were knew to the school or who need re-application. In addition to clinc, Sionfonds students were weighed and measured for assesment purposes for a grant we are applying for. Sponsored students wrote letters to their sponsors , had their photos taken. It was a busy chaotic and enjoyable day. In addition it was exciting for me to be in Cavaillon, and look at the site of the school that we are going to build this year. Sionfonds receieved a grant to replace the current school which is a pole and tarp structure. Today we head farther out the southern leg of Haiti to Chardonier a spectacularly beautiful little village on the sea shore. We will be out there until Sunday sleeping under the stars ( and our mosquito netting ) listening to the Caribbean sea by night and working our selves to exhaastion everyday! What could be better? ?